You might want to think twice before diving head first into this free-to play mobile game. Zombies shambled to the forefront of pop culture in recent years. The inevitable undead apocalypse is a plot point in many successful movies, games and television shows, but what do zombies do in their spare time? Maybe all they want to do is carry on normal lives and have normal professions. 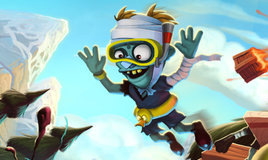 In Zombie High Dive, you get to live out Hubo the zombie's dream of becoming a champion diver. In Zombie High Dive, you take Hubo from training to competitions and eventually through the zombie diving ranks to become champ. Throughout most of the games, you enter competitions via your agent and compete against other zombies. Zombie High Dive uses a system similar to Angry Birds, in which you hold the character back, plot the trajectory and release; you also need to account for wind resistance. Once you release, Hubo will jump from the platform and then you tap and hold the screen to perform spins. After you make your dive, you are judged based on the right number of spins and the angle in which you landed in the pool. The game is very easy to pick up and start playing, but takes a lot of practice to master the physics of the spins and the release trajectory. Graphically, the game looks polished. If you hit a wall or object on your dive, you can see your head or other body parts go flying. You may also miss the pool entirely and watch as your body splats on the floor. This cartoon-like feel goes well with the game's sense of humor. Zombie High Dive has an interesting story and good gameplay, but getting into the game is the problem. It runs on an energy system that uses one ticket per play. You only have four tickets before you need to stop and wait for your energy meter to refill. This means taking breaks from the game just as you're starting to get into it. The game also has an ad after every competition, which is another thing impeding you from playing this game. Even though you are supposed to compete against other zombies, you never see them make their dives, and you receive a point total to beat. While this isn't a huge problem, it would of added to the aesthetics of the game to see other divers. Zombie High Dive can be fun and easy to play, but there's too much blocking your path. Download Zombie High Dive for iPhone and iPad.